Russian photographer and urban explorer Ralph Mirebs just published one of the saddest photoseries on space exploration. 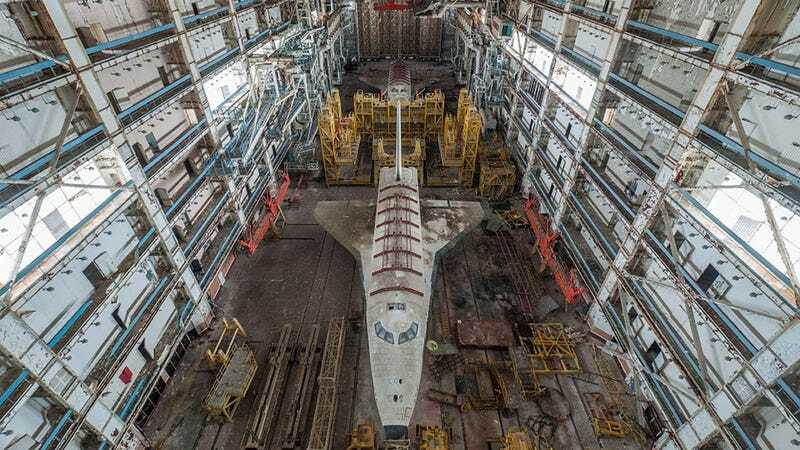 He managed to get inside an abandoned hangar at the Baikonur Cosmodrome, where two Burans—the prototype space shuttles of the Russian space program—are slowly decaying in their burial crypt. The Soviets’ Buran program lasted nearly two decades (from 1974 to 1993), and only one automated orbital flight had been completed before the whole project was canceled due to lack of funding when the Soviet Union collapsed. In the photos below, you can see two unused, debris-covered Buran shuttles in the hangar. This still amazing superstructure was originally built for the assembly of the Soviet N1 moon rocket, and later used for orbiter maintenance and to connect the orbiters to their Energia launchers, so its role was very similar to the function of NASA’s VAB (Vertical Assembly Building). One of the two shuttles is OK-1K2, nicknamed Ptichka (Little Bird), which was almost ready for spaceflight in 1992. It was about to make a second flight in automatic mode, docking to the Soviet space station Mir. The second shuttle is a full-size static mock-up for mating and load tests. And it is really, really sad to see them in their current state of disrepair. All photos by Ralph Mirebs, republished here with permission. You can follow the photographer on his Livejournal page, on Instagram, on Twitter.